True porridge should be cooked in a pan and stirred with a wooden spurtle (stick). 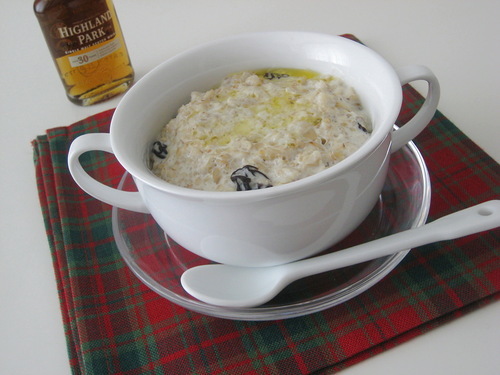 I like my porridge with dried fruit (dried cherries here), lashings of cream and a drop of whisky. Enjoy! - Place the oats in a heavy saucepan and add the milk or water. - Bring to a slow boil, stirring all the time until the porridge begins to thicken. After approx 7 mins (sooner if the porridge is thick enough and heated all the way through) remove from the heat and leave to stand for 1 min. - Serve in warmed bowls with either maple syrup, brown sugar, golden syrup or a teaspoon of jam as preferred.